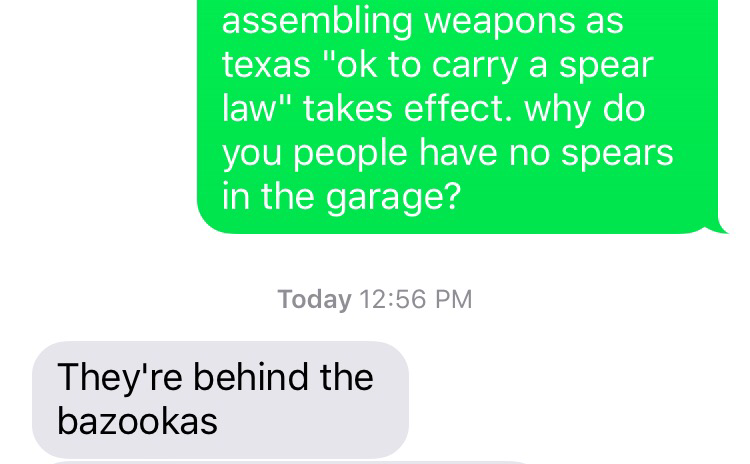 We’ve searched the garage, and the horrible truth is evident: We can’t find a spear. Texas’ new law has just gone into effect. It’s now legal to carry long knives, daggers, bayonets, and yes, even spears around in public. I was not aware of a clamoring for spear toting, but then I’ve been gone for a year. I am filled with the same feeling of dread I had in the 1970s with the arrival of bell bottom pants. Not a fan, but you have to surf the wave when it cones along. Actually I lived in Corpus and we had no waves. Or bell bottoms. But still. So Rick and I are in the garage, looking through the Smith Boy tool collection for suitable weapons. There are old typewriters and a collection of coffee cans. An assortment of posters from an ancient Kate birthday party. Hammers, at least three band saws (note to self: perfect set for “the texas band saw massacre”), but not a spear to be found. Thinking Rick might just be overlooking them, I text June. This makes perfect sense, except I can’t find the bazookas, and I’m unsure if they’re covered by the new law. In the end, being Smith Boys, we improvise. 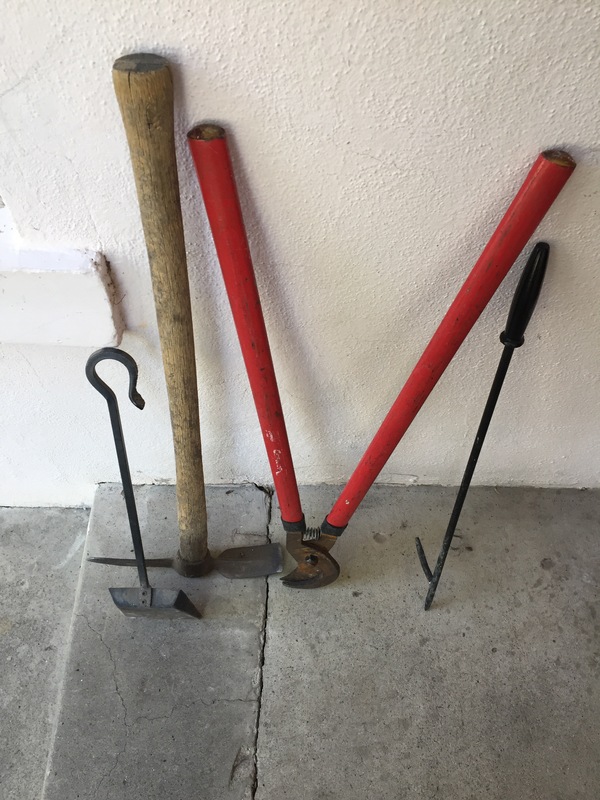 We come up with a pick ax, a bolt cutter and a couple of fireplace tools. The plan is to wear them to Uncle Bob’s place. He’s an artist and metal sculptor. Having seen our pitiful collection, he will hammer out some proper swords for us. Genius. Mike and Laura pick us up. We load our weapons in the back and drive to casa de bob. A delightful visit, a wonderful meal, a tour of the art garden, and we’re off. Only after Rick and I are back home do I realize that not only did we forget to show our weapons to Bob, but we also left them in Mike’s trunk. Now it’s getting dark, there is thunder outside, and we are armed only with a swifter and a Chihuahua. Why did someone go to all the trouble of legalizing open carry for spears? Just when you think the Legislature can’t get any more insane … ok, I’ve never really thought that. We spend the last hour of the evening reading quietly. He’s tearing through the new Dearen book; I’m reading a think piece on how “chainsaw massacre” was a veiled lesson in vegetarianism. a cool, rainy evening. We could start a fire in the fireplace, but most of the tools seem to be missing. The Smith Boy theory was always that the pen was mightier than the sword. it will be interesting to see how it fares against the spear. I’m going to look for those bazookas just in case. This entry was posted in margarine, running and tagged family, life, yellow brick road. Bookmark the permalink.